I missed the whole Spiralizer fad when it came around a while ago. I mean, I was aware of it, but I just couldn’t see how shaping a vegetable to resemble something else could possibly be that tasty in the grand scheme of things. Spaghetti’s cheap enough to buy (even the gluten-free stuff’s not that expensive nowadays) so why would I feel the need to substitute it with a vegetable? However, not too long ago I picked up a Spiralizer dirt cheap and it’s been sitting in one of my kitchen cupboards ever since. So, when I spotted it lurking at the back of the cupboard the other day I figured I should give it a whirl. 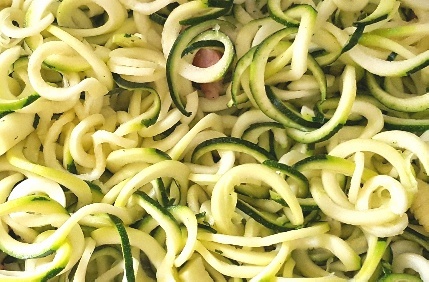 I tend to buy courgettes quite frequently so I’m pretty much guaranteed to always have some in the fridge and I reasoned that they’d be an ideal vegetable to try out the Spiralizer with. I also had a jar of sundried tomato pesto in the cupboard and a packet of sausages in the fridge so it stood to reason that courgetti with pesto and meatballs would be a good meal for that evening. I must admit, I was really sceptical as to whether the courgetti would be tasty because courgettes aren’t exactly known for naturally brimming over with flavour anyway, but oh my goodness, when I tasted the finished meal I realised that they were actually delicious! They were also very filling and made a very substantial meal. All I’d done was fry balls of sausagemeat in a large frying pan before adding the courgetti and cooking until it became soft and then adding the pesto and stirring it through it. It was as simple as that, but good grief, it was outstanding. The courgette spaghetti added not only a lovely fresh flavour to the meal, but a delightful and substantial texture too. 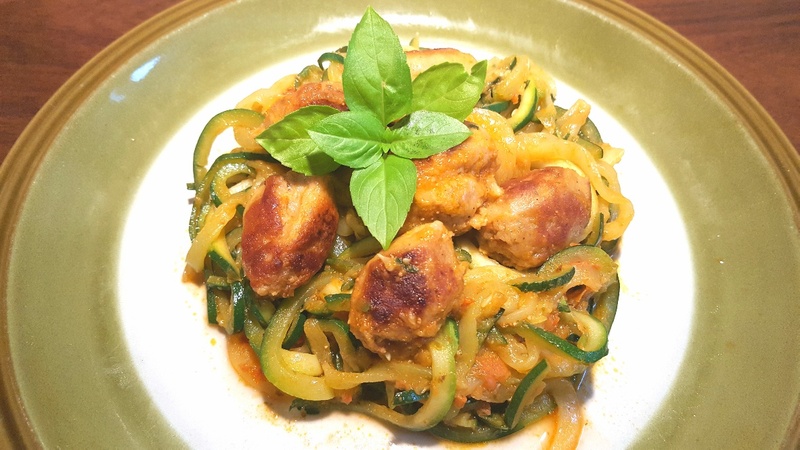 Whereas normal spaghetti is fairly flavourless and bulky, the courgetti really added an element of interest to the dish and complemented the sausage meatballs really well. 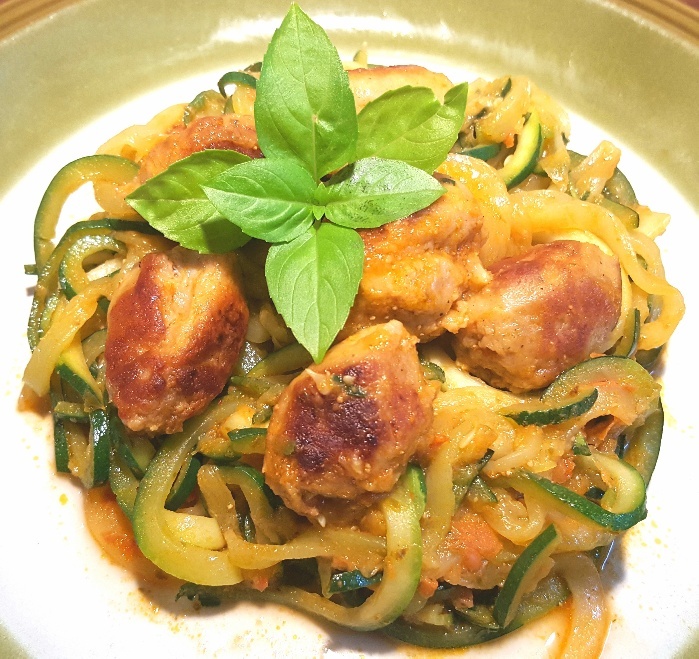 Courgetti with meatballs might sound quite plain and it might not entice you into purchasing a Spiralizer for yourself, but chances are quite a few of you already own one and I’d seriously encourage you to try this recipe. 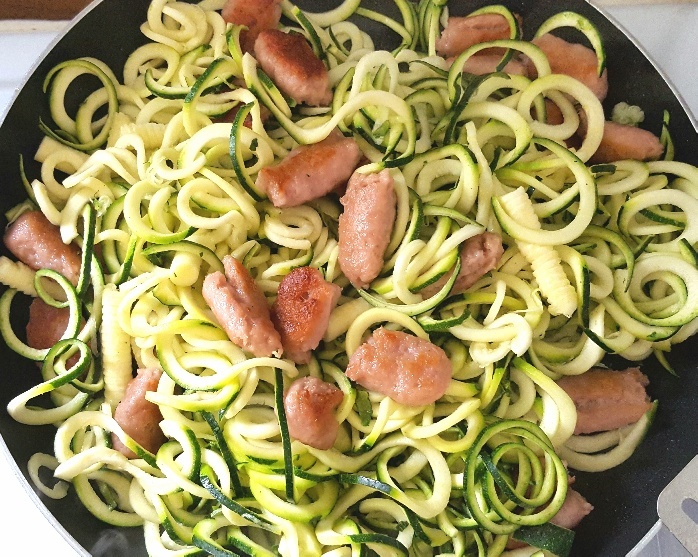 It makes a plateful of soft, fresh courgetti that’s lightly coated in sweet sundried tomato pesto and is dotted with tasty little balls of sausagemeat. Sadly, I’ve realised that Spiralizing is a fad I should have tried a long time ago. Remove the sausages from their casings and form small meatballs with them. Fry them in a frying pan until cooked. While the meatballs are cooking Spiralize the courgettes. Once the meatballs are cooked add the courgetti and fry until just soft. Stir the red pesto through the courgetti and serve.